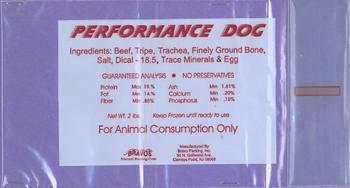 Bravo Packing of Carneys Point, N.J., is recalling all Performance Dog products, a frozen raw pet food. The recalled products come frozen in 2-pound and 5-pound plastic sleeves with the manufacture date code 071418 printed on the boxes that contain the plastic sleeves, but not on the individual plastic sleeves. Consumers with questions may contact Bravo Packing at (856) 299-1044 Monday – Friday from 6:00AM-2:00PM, and on Saturday from 4:00AM-9:00AM EST) or online at www.bravopacking.com.